Have you ever had a sense that something is bubbling beneath the surface? That you don’t know what it is…but something is getting ready to give birth…to step forward…to unfold? If you focus on it, you recognize there’s an energy building. It’s palpable. And then when it does present itself, you’re taken with the depth of feeling, realizing it’s come through you? If you’re reading my words here, then you’re likely one of those who has experienced this process consciously, perhaps in a variety of forms, and recognized the gift. If you look back in time, you could identify what kickstarted the process. On March 10, I returned from Hopi and my first spiritual travel program there, only made possible recently—with much gratitude to Hopi Spirit Keeper friends. From opening to closing circle, there was something greater than any there carrying us all. It felt as though another door had opened, some kind of emphasis marking out the great importance of honoring sacred Indigenous ways—now. If I ever had a doubt about the lifework I’ve chosen it was blown out of the water. Such a thing is bigger than any small-minded worry I’ve ever had. Intent gave evidence throughout our time there and unfolds yet in its effect. An unanticipated gift stood out particularly: permission from Hopi religious leader Lee Wayne Lomayestewa for entry to Prophecy Rock. Such a privilege is not usually granted to outsiders. We all felt the honor, and I’d invited people to sit in meditation and open to whatever was there for them. One of the travelers had been on a spiritual journey, involving extensive physical travel as well, since major life transitions in 2012. She indicated to me that, while what follows is deeply personal, it’s universal and gave permission to share. Relationship had become foremost in her awareness and the unexpected time at Prophecy Rock became her personal connections in prophecy. Climbing high, up beyond her comfort zone, to find her meditation spot, three figurative “drawings” forged by nature, on weathered rock, spoke to her: “…of prophecy, unity and stages of living and dying…” She said she could form few words to describe the experience, but “…words and song came forth. The experience is etched in my being.” I heard her song floating on the breeze. I tend to think it entered us all. Janet Harvey of Asheville, North Carolina said poetry began to pour through her and shared several. 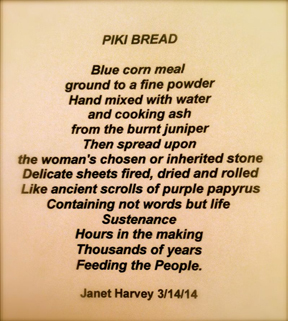 Piki Bread, the expressive poem below strikes me as a message about the beauty of simple actions that sustain us over time. They create meaning in life. She mentioned that the physical shape of the lines as they’re shown seemed significant. I told her it reminded me of the backboards worn in some ceremonies by Hopi dancers. For my part, I’ve noticed another level of ease appearing in my writing. It comes out as though waiting for me to take the initiative. With my artwork, an uncontrived process began shortly before our time on Hopi and has amplified since. In the morning I began to sit in meditation near my easel, a different part of my home than habit for my daily ritual. And placement of images, color and symbolism, have been relayed to me during this time in a way I can’t describe except by sharing what I’ve recently produced. These pieces have taken on depth of meaning introduced from somewhere other than me. I don’t claim ownership. But perhaps the greatest gift came inadvertently from the Hopi Spirit Keepers themselves and expressed directly to me by the group in our closing circle. My Hopi friends opened their hearts, gave us their trust and spoke unequivocally of the real dangers acting against continuity of their sacred traditions. It was poignant. This is a time to listen and integrate from those who, on a daily basis through their prayers and actions, hold the sacred threads that weave our deeper values. There are many voices to be heard, not just one. Hearing them lends respect and supports continuance. We who hold sacred witness become better for it. It affects us, too. Certainly it eschews any hint of commercialism but is rather something of deeper service. Somehow I have been graced with holding such a precious container. The group reinforced what I already knew but drove the point home succinctly in a way I couldn’t set their message aside. * The work continues. *Any of us experience doubt, particularly when we’re called to something. It’s only because we’re called that something steps forward to test intent. 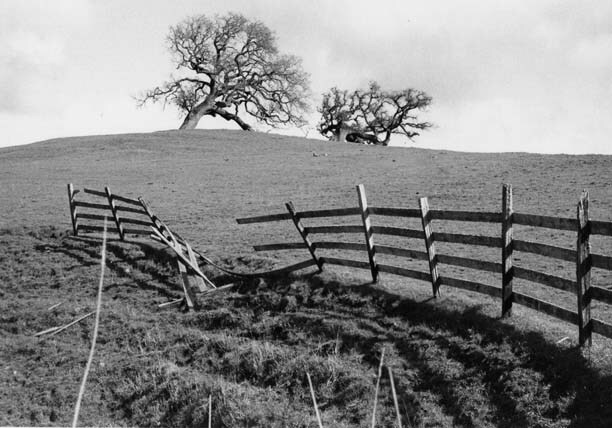 When internal conflict is resolved, you step through a threshold. Note: By participating in our spiritual travel programs you support the ongoing existence of Indigenous wisdom traditions in danger of decimation. Spiritual Travel to Peru, Oct 24-Nov 2, 2014: I have been invited to the Q’ero village of Ccochamocco, a real honor and rare opportunity. Tuitions help support: sponsorship of Hopi Elder Harold Joseph on this journey seeking prayers for his people from Q’ero relations; the new Q’ero Ancestral Culture Center and natural medicine clinic; and Grandmother Flordemayo’s seed saving program. Spiritual Travel to Mexico, Jan 19-29, 2015: Tuitions help support sponsorship of David Mowa, Hopi medicine man, to share traditions with Maya relations; and the humanitarian healing work of Don Sergio Castro in Chiapas, Mexico. This program in final planning and will be uploaded here shortly. If you’re interested in my artwork entitled Testimony or others, go here. Twenty percent of profits go to support Native traditions through Kenosis Spirit Keepers, the nonprofit arm of Kenosis.